Due to the positive responses from Meals,” I came home today and started cooking the minute I walked into the house. I was driven b the debut of “Rasa Malaysia 30-Minutey the intention to further impress my readers. Inspired by Eat First Think Later’s recipe, today’s creation is Salty Pancakes with Dried Shrimps and Shredded Cabbages. The end results, as you can see on your screen, are absolutely delish. This meal took me practically 20 minutes to prepare and I am not exaggerating. Using some of the most basic ingredients, these salty pancakes with dried shrimps are rather filling. Serve them with squirts of chili sauce and you will be in food heaven. Soak the dried shrimps in hot water for 5 minutes. Whisk all ingredients in a bowl until well blended and smooth. Heat up the pan and add some cooking oil. Use a ladle to scoop up the batter and pour it onto the pan. Flip the salty pancakes and cook it to light brown on both sides. You can substitude shredded cabbages with 1 stalk of scallion (chopped). Rasa Malaysia recommends Maggie Chili Sauce if you are in Malaysia or Sri Racha Chili Sauce if you are in the United States. i AM impressed! shrimp again!! it’s a pity i don’t cook. Wow! Looks lovely….mmm…with dried shrimps, good stuff! Great idea! I ‘m thinking of variations with sambal heebee already. What wonderful savory pancakes! I would love it for a weekend brunch! Boo – Sambal Heebee…good idea. You don’t need the chili sauce then. Asha – thanks for visiting RM and yes, Happy Thanksgiving to you too. 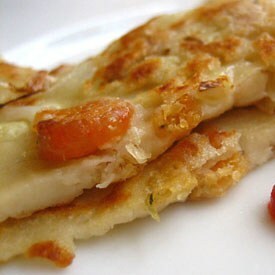 I like this kind of home cook pan cake very much!!! It nice serve with chilli sauce. Wow, you make the recipe sound so easy! Yet the outcome looks wonderful and like you kneaded that dough for hours! your entries never fail to make me feel hungry… sheesh! Ho – yep, you can’t get this kind of home-style pancakes at restaurants. Gotta make them yourself. Passionate Eater – It’s really easy. I wasn’t “bluffing.” There is no need to knead the dough, just whish everything together and voila, they are done! Chris and all readers of Rasa Malaysia – Happy Thanksgiving to all. I am not going to make any Turkey or American traditional food, stay tuned for what I am going to cook! Michael – Just make sure you don’t drool in your cubicle or Elliot is going to tell Company X’s boss! Meiyen – I agree with both hands and both legs in regards to home-cooked food is the best! Teckiee – no need to email, you can just lick them off the computer screen. Muahahaha. can i know how much is one cup? 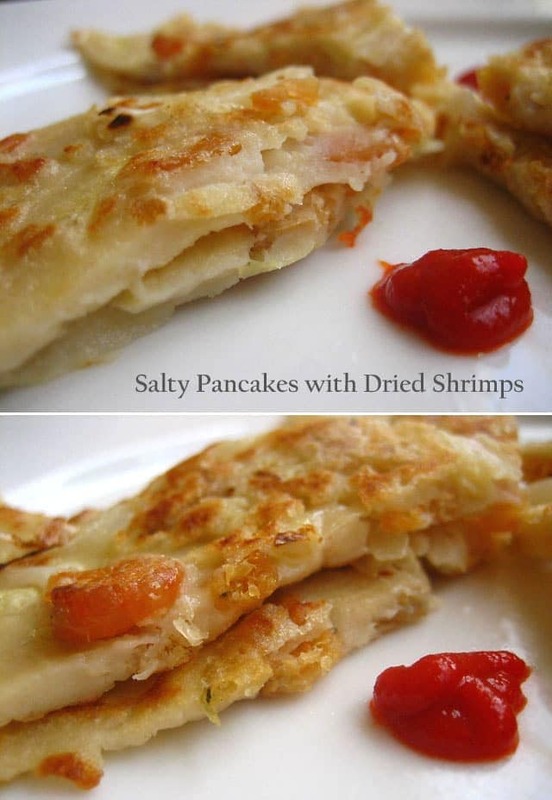 I made this using your salty pancakes with dried shrimp recipe and my hubby loved it! Hi Bee, this is the 2nd recipe I tried of your website. Tasty and easy to make. Normally, my daughter is not a fan of pancakes but she loves it. Thanks for sharing! OMG Bee! Love this recipe, yummy! ~_~ Thanks!